Something good just got better. 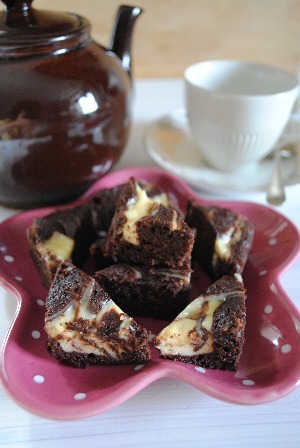 Take your favourite chocolate brownie recipe, dot the brown, cocoa-rich batter with dollops of a simple vanilla cheesecake mixture, swirl and bake. Irresistible? They never seem to last long here. There’s just something about the moist chocolate brownie contrasted with the slightly sharp flavour of the cream cheese that makes it difficult to stop at one piece. I cut them into small triangles so that going back for another one (or two) is less of a problem and more a necessity. Feel free to substitute your own favourite brownie recipe but the one I use below, normally made with toasted walnuts, is a great storecupboard standby. Next time I just might have to try the recipe for Chocolate and Knockmealdown Porter Brownies. Preheat the oven to 180°C (170°C fanbake) and thoroughly butter a shallow 2 x 25 x 3Ocm Swiss roll tin. First make the cheesecake topping: whisk the cream cheese, egg, vanilla extract and caster sugar together. Set to one side. To make the brownie batter, sift or whisk – I generally whisk – the flour, cocoa, baking powder and salt together in a large bowl. Melt the butter in a large saucepan and allow to cool. Add the caster sugar and vanilla essence and stir thoroughly. Mix the eggs into the batter, then gently stir in the sifted or whisked dry ingredients. Pour and scrape into the prepared tin. Dot random spoonfuls of cheesecake topping across the top and, using the back of a teaspoon, s-w-i-r-l. Bake for 20-23 minutes until the brownies are just set in the middle. If your testing toothpick or skewer comes out with a couple of crumbs clinging to it, all the better. Cool on a rack before cutting into triangles. Makes 24 brownies – or cut them in half for a multitude of mini-triangles. That just about sums it up, Zach! Looks absolutely delicious! I would so love to try some. I know those brownies would taste amazing. I’ve loved that brownie recipe forever – and I’m sure you’ve tasted it too. Bet the kids will love to help!